Heating and cooling systems, also known as HVAC systems, keep your home at a comfortable temperature year-round, providing heated air in the winter and cool air in the summer. The ducts and vents that deliver this air to the various rooms in your home are not something that you think about often. But leaking ducts can cost you money, and dirty ducts may be the cause of allergies. 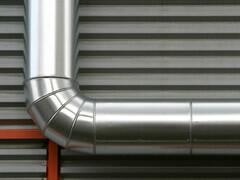 Today's ducts are not sheet metal boxes, but insulated flexible tubes. Sometimes contractors forget to attach the ducts to vents or other ducts, and air is vented into the attic or crawlspace instead of warming or cooling your rooms. Ducts can be snagged on exposed nails, causing tears or holes that leak air. Dirty ducts and vents can cause allergy symptoms or breathing problems for family members. And most surprising of all: duct tape is not good for sealing ducts. It will dry out and fall off over time. If you have a new home with a room that is too hot or too cold, there may have been an oversight in construction that failed to connect the duct to the vent in that room. If you have been in your home for a few years and your energy bills suddenly rise, you may have a leaking or kinked duct. In either case, you should call a professional HVAC service company. They will perform an inspection and correct any problems, make sure that your ducts are properly sized and routed for best airflow, and replace duct tape with more reliable sealing methods. Even if you don't have a problem, it's a good idea to get your HVAC system professionally checked every year. To find a reliable HVAC contractor or a duct cleaning service, just submit the form on this page.